Histological Aspects of the Healing of a Gastrotomy in Different Gastric Regions. The endoscopic transgastric technique is increasingly gaining popularity among surgeons and gastroenterologists. Factors that could potentially limit the use of the gastric lumen to endoscopically access the intra-abdominal cavity have not been fully investigated. The gastric chamber is a complex organ, physiologically and anatomically. The healing process of the gastric wall following a transgastric procedure and its impact on future gastrotomies has not been well studied. Little is known about the healing of gastrotomies at different locations. Our hypothesis is that gastrotomies located in the fundus, body and antrum will show different healing properties. 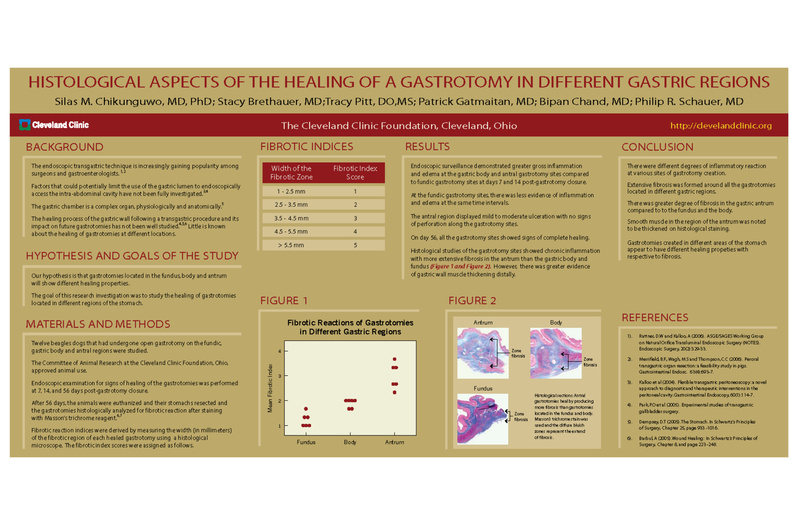 The goal of this research investigation was to study the healing of gastrotomies located in different regions of the stomach. Twelve beagles dogs that had undergone gastrotomy on the fundic, gastric body and antral regions were studied. The Committee of Animal Research at the Cleveland Clinic Foundation, Ohio, approved animal use. Endoscopic examination for signs of healing of the gastrotomies was performed at 7, 14, and 56 days post-gastrotomy closure. After 56 days, the animals were euthanized and their stomachs resected for histological analysis. Endoscopic surveillance demonstrated greater inflammation and edema at the gastric body and antral gastrotomy sites at days 7 and 14 post-gastrotomy closure. At the fundic gastrotomy sites, there was less evidence of inflammation and edema at the same time intervals. The antral region displayed mild to moderate ulceration with no signs of perforation along the gastrotomy sites. On day 56, all the gastrotomy sites showed signs of complete healing. Histological studies of the gastrotomy sites showed chronic inflammation with more extensive fibrosis in the gastric body than the antrum and the fundus. However, there was greater evidence of gastric wall muscle thickening distally. There were different degrees of inflammatory reaction at various sites of gastrotomy creation. Extensive fibrosis was formed around all the gastrotomies located in different gastric regions. However, there was greater degree of fibrosis in the gastric body in comparison to the fundus and the antrum. Smooth muscles in the region of the antrum were noted to be thickened on histological staining. Understanding the process of gastric tissue repair after a transgastric procedure has clinical relevance with regard to gastric motility and the creation of future gastrotomies. Fibrotic gastric tissue could potentially limit gastric motility function.